Most of my East Coast snake encounters have been with Garter Snakes. A few days ago I got to meet a clump of Northern Water Snakes (Nerodia sipedon), who were basking in the afternoon sun on a log along the Wissahickon Creek. 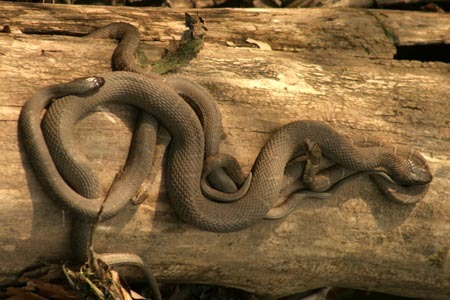 The banding and coloration of water snakes are somewhat variable, but in general, the adults are dark gray, while the younger snakes have distinct tan and dark banding. 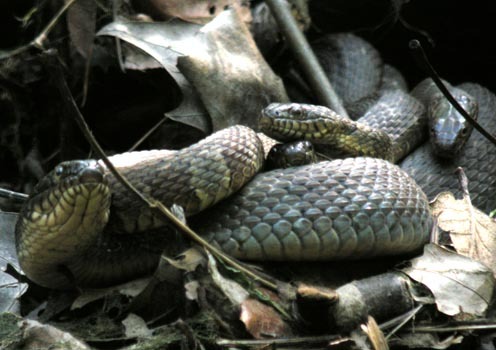 Sometimes a water snake will have a darker upper body and lighter underside. When wet, the snakes’ banding will be more apparent. As the snakes age, the bands will grow fainter until an older snake may take on the appearance of a dark rubber hose flopped over a log. Water Snakes can grow to 4 feet or more. The thick body and basic color of water snakes make them easily mistaken for Cottonmouths / Water Moccasins(Agkistrodon piscivorus) and for Copperheads (Agkistrodon contortix). 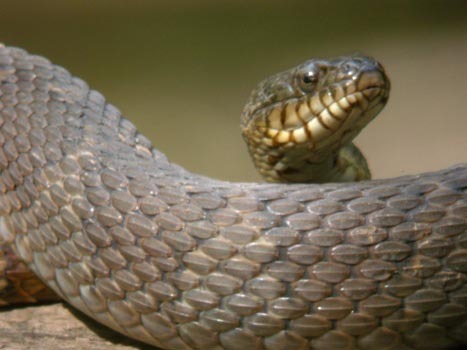 However, the bands on the Water Snake differs from that of the Agkistrodons in that the darker bands are wider than the lighter ones, and the bands are less irregular. There are some other distinctions though. For instance, if you peer closely into a water snake’s eye, you will note that the pupil is round, and not at all similar to that of the venemous Cottonmouths and Copperheads. Also, while copperheads and watersnakes have loreal scales, the cottonmouth lacks one. I, however, just plan to rely on color pattern. 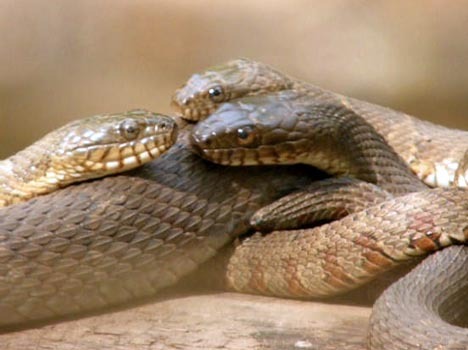 These snakes dine on fish, frogs, salamanders, leeches, and other small animals. In turn, they are preyed upon by snapping turtles, other snakes, raccoons, otters, oppossums, and foxes. Females give live birth in August to October. No babycare is necessary for Mr. and Mrs. Sipedon, and everyone can get back to basking on that log before winter sets in. Then it’s hibernation time. A favorite place to spend the winter is in muskrat or beaver dams, even sharing the accomodations with those Copperheads. Although water snakes are not venemous, they can deliver a nasty bite and won’t hesitate to do so if approached. If that doesn’t get your attention, they will defecate and emit an unpleasant musk. They just like to be left alone as they bask on a sunny log or coil up in a cozy clump amidst some protective vegetation. Can you find all four faces in this heap o’ Nerodia sipedon?